You are here: Home › 2017 › Summer › FAFSA › Six Months into the New Administration: What’s the Prognosis for Higher Education? What will change under U.S. Secretary of Education Betsy DeVos? 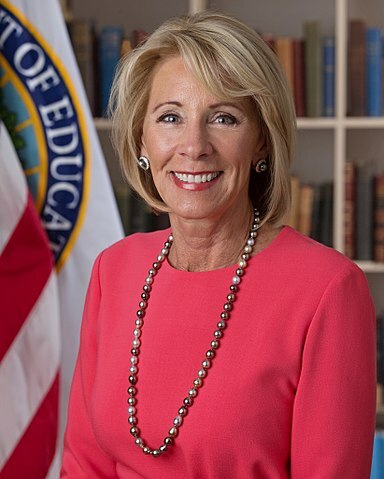 At the U.S. Department of Education, the prior and current administrations seem to agree on the objective of “taking care of students first” but with strongly opposing views on how to accomplish that noble goal. While the new Secretary of Education, Betsy DeVos, cares about students, the vast majority of her career focus has been in elementary and secondary education with little to no experience in post-secondary and higher education. That is not necessarily a negative, since an effective leader will depend upon her team of subordinate leaders to advise her on higher education policy. But that is where a second and very real problem lies: several key undersecretary leaders have departed the Department leaving a bit of a leadership vacuum. While new leaders have been appointed, it takes time for them to learn the intricate policies and systems involved with the administration of the federal financial aid programs. Also, these leaders need to have clear policy guidance regarding the new administration’s priorities and goals. To date that policy guidance has not yet materialized. We have reached this conclusion not by hearing the opinion of any one person at the Department of Education but by observing the level of inaction on new issues and resolution of old/existing issues at the Department. Delay of implementation of the Gainful Employment Regulation, which has great positive effects on proprietary institutions and institutions with non-degree programs. The return of the year-round Pell Grant that is being rolled out in 2017–2018. Beyond that, it is our belief that the status quo will be the order of the day until the goals and objectives of this administration with respect to Postsecondary and Higher Education are more clearly stated by both the President and Secretary and leaders become familiar with the systems and intricacies of the education system.